The second Bat Segundo program involves several interviews conducted at BookExpo America 2005, which were strung together into a program. 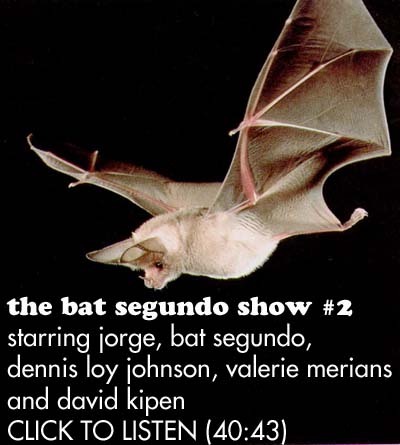 At the time, Bat Segundo hadn’t quite figured out what it was about. Even the Bat Segundo character at the beginning isn’t entirely defined. But this program does provide a modest glimpse of the publishing industry in 2005, which was before ebooks — especially when one considers the passionless money-grubbing jerk that Johnson has since dishearteningly transformed into. 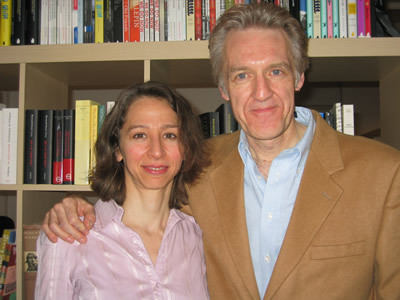 Dennis Loy Johnson and Valerie Merians had just started Melville House, with David Kipen (formerly of The San Francisco Chronicle) publishing a short book called The Schrieber Theory. These conversations were recorded at the Melville House booth. Condition of Mr. Segundo: Dismayed, fascinated, and deluded. Subjects Discussed: The state of publishing, the early days of Melville House, Lewis Lapham’s trip to India with the Beatles, the Beach Boys, Mia Farrow getting kicked off of Frank Sinatra’s yacht, the Saturday Evening Post, the Melville Manifestos, pamphleting through small inexpensive books, how to beat the two year book production cycle, the difficulties of selling books, B&M stores willing to buy anything that sells even if it comes from an iconoclastic figure, difficulties with Amazon, stores that object to book covers, not putting blurbs on books, Stephen Dixon, alternatives to the auteur theory, Shriner vs. Schreiber, Ring Lardner, Ben Hecht, Paddy Chayefsky as a natural existentialist, Altered States, The Americanization of Emily, contending with rewrites in considering the screenwriter as the center of a film’s strength, corralling the Schreiber Theory with Citizen Kane, William J. Dowling’s Beatlesongs, Monty Python writing credits, Robert Towne and Personal Best, Billy Wilder’s writing partners, Nicholas Meyer’s adaptation of The Human Stain, publishing unproduced screenplays with Red Pen, Robert Rossen, Charlie Kaufman as a brand, Double Indemnity and Raymond Chandler, Dalton Trumbo’s letters, nonexistent people getting credit for screenplays, Quentin Tarantino’s Silver Surfer contributions to Crimson Tide, Richard Corliss’s Talking Pictures, special DVD collections by writer, and turning screenwriter names into adjectives. Johnson: We’re trying to harken back to the pamphleting age when books were journalism and were news. And we think now that with the failings of the mainstream media that books can take up a lot of the slack and perform that function again. [Johnson refers to the “Melville Manifestos” line, which was abandoned sometime around 2006 for less risky and more mainstream Melville House books.] So we’re going to be doing a series of short books. Maybe not reprints. But maybe we saw a journalist writing about something and we said, “Look, do you have a polemic about that? Do you have a manifesto about that? Do you have a short investigation about that that would make a good, hard-hitting, inexpensive book?” We’re trying to make these small inexpensive books that are just more timely than is used to. Melville House — Valerie can chime in on. We’ve become unfortunately famous for making books really fast. And it’s been really killing. But we do think that books can be made on shorter than the two year cycle that’s normal in publishing. And maybe that way, we can make up for what’s going on in mainstream media. Correspondent: I’ll get to you, Valerie, very soon. Because I don’t just want this to be the Dennis Show. But in terms of the two year cycle, what is your average sort of cycle for a Melville House title? And how do you go about doing this? Maybe Valerie might chime in with how that’s done. Merians: Melville House cycle. My goodness. Usually we see something, fall in love with it, and run with it as fast as we can. Unfortunately, publishing does have certain constraints. It’s a very slow-moving beast. And we’re trying to speed it up a little bit. But we’re getting tired. But the usual cycle for a book is about a year and a half. But, for us, I would say it’s about nine months really. Merians: It really does vary. I mean, we did a book in three weeks. And that was very exciting and almost killed it. But it was worth it. So the best thing about Melville House is that we’re small and light and we can adjust quickly if we see something we feel needs to be out in front of the public and we feel we can get it out there fast. Correespondent: Well, for other publishers who hope to maybe publish something out in three weeks or definitely less than the year and a half cycle, do you have any tips to impart? Merians: Don’t do that. It hurts. There’s a reason why we have a nice leisurely cycle. It’s a big country. It’s got to get distributed throughout the United States. Everyone has to learn about it. All the booksellers. Johnson: That’s the issue. I mean, the business. The structure. Merians: It is the structure of the business. Johnson: People really don’t understand. Most writers, published authors, don’t really understand how the apparatus works. And it’s very complicated. And there are many parts. And the business itself doesn’t like books made at a step beyond a certain speed. Because you have to make booksellers aware of a book. That involves a catalog. That involves a certain amount of time to make the catalog. Merians: Sales reps on the road. Johnson: Sales reps need to go out and represent that book. You need a certain amount of time to physically make the book. Which is a longer time than you would think. You need a month process to fully distribute a book. And so that’s why the average mainstream publisher, the conglomerate publisher, likes to have about an eighteen month or two year cycle of processing a book. So when we crash a book, as it’s known, it’s a fight. It’s a real fight. Where you have to go to people out of schedule and beg them for their attention and their time and the space in their store. I mean, the book Valerie mentioned that we did now was a book that we did right after the election last year — the presidential election — and we were trying to get places in stores in December. The busiest month of the year for booksellers. And they’ve already got their store full. They have no space left. So it’s quite a struggle. And that’s why these times are kind of standard. And if you want to go against that, it’s a fight. But publication is a fight anyway. So we decided to take it on every now and then when we feel it’s worth it. And luckily for us, people have responded when we’ve done it. But there could be a time when nobody responds. And then we’re both be in physical pain and other kinds of pains. So there are risks. Correspondent: One last question. There have been repeated struggles of other publishers trying to get books into chains. To get into the Barnes & Nobles and the Amazons, etcetera. Have you faced anything along those lines? Any problems? Johnson: Not really. We have had a lot of success with the chains. And I say that as someone who for years, as you know, Ed, was a great critic of the chain booksellers. I do feel that they’re having a negative impact on our culture. But as a businessman, I can’t say that they turned down my far left political book, for example. If they think it’s something — it’s a pretty straightforward business deal. If they think they can make money off of it, they’ll buy it from you. It’s really that simple. Where it gets complicated is in kinds of pressures that you are under for the look of a book, for display money, for different kinds of display deals. [Note: Melville House does not pay any co-op money.] There, the big boys are the 800 pound gorilla and they might throw their weight around a little bit. But I can’t say that I felt — and they know who I am. I’ve walked into many a meeting with a Barnes & Noble executive where they said, “Oh, you’re that Moby Lives guy.” [Note: Before Moby Lives was folded into Melville House, becoming a desperate, attention-seeking, and neutered shadow of its former self, it was, as any Web Archive trip can attest, an iconoclastic and entertaining corrective to mainstream book news.] “You’re that guy that wrote about us. Oh, we like this book. We’ll take 2,000.” So I have to hand it to them. I mean, really, the behemoth for us is Amazon. Not the brick and mortar stores. Amazon is always a complicated one to deal with. And they’re very difficult. They’re very difficult. They’re difficult in a business sense and they’re difficult in an informational sense. Because every single one of our books, I believe, that’s up on Amazon right now has some crucial bit of information wrong. A price. A title. An author. A publisher. A pub date. An ISBN number. That we can’t get them to fix no matter what. So there’s all kinds of issues with Amazon as a huge behemoth retailer, but not with the real world stores.